How Do I Connect A Mic and Use The Karaoke Feature My MX-FS8000 Giga Sound System? You can connect a microphone to the 3.5 mm MIC jack on the front of the Giga sound system and rock out to your favorite CD's and USB tracks by using the My Karaoke function. Follow the steps below to connect a microphone and start using the My Karaoke function. 1. Power off the Giga sound system if it is on, and connect the microphone to the MIC jack on the front of the system. • If your microphone plug is larger than the 3.5 mm MIC jack, you need a connector-adapter (not supplied) to complete the connection. • When using a connector-adapter you must first connect the connector-adapter to the MIC jack on the front of the product, and then connect the microphone. 2. Press the MIC VOL - or + on the Giga sound system remote control to adjust the volume on the microphone. 3. Press the My Karaoke button on the remote (bottom row of buttons) to supress the vocals if you need. Each time the button is pressed the function toggles through My Karaoke on__> My Karaoke Off. • If you hear a strange noise (squealing or howling) while using the Karaoke feature, move the microphone away from the speakers. You can also try lowering the microphone or speaker volume. • The microphone will not operate when the Giga sound system is in Aux or Tuner mode. • The Giga Sound mode is disabled when a microphone is connected, to enable the sound mode again you must disconnect the microphone and press the Giga Sound button. • When My Karaoke is on, EQ and Giga sound modes do not work. 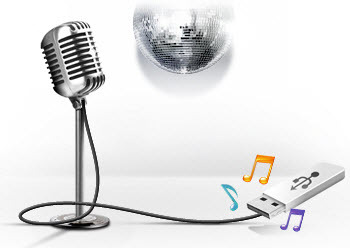 • When you stop playing a CD or USB the My Karaoke function is disabled automatically. • My Karaoke is only available for selection when a microphone is connected. My Remote Isn't Working, How Do I Determine If I Need Service? How Do I Connect A Mic and Use The Karaoke Feature My MX-FS9000 Giga Sound System?